This May 2, 2018 file photo shows the exterior of a Blockbuster Video store in Anchorage, Alaska. 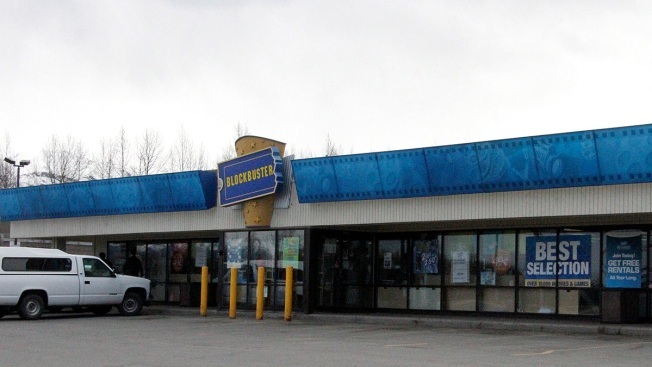 Alaska's last two Blockbuster video stores are calling it quits, leaving just one store open in the U.S. The closures come just two months after the host of HBO's "Last Week Tonight with John Oliver" sent a jockstrap worn by Russell Crowe in the 2005 movie "Cinderella Man" and other items to the Anchorage store, which displayed it in an effort to ramp up business. "You would not believe how much business we got just from that memorabilia alone," he said. "I can't thank John Oliver or his show enough." But it wasn't enough to counter a planned lease increase at both Alaska locations. "How exciting," said the Bend store's general manager Sandi Harding. "It might end up being a little chaotic for a couple of weeks." "We have no plans on closing anytime soon," Harding said.